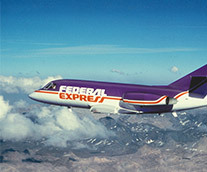 FedEx began as Federal Express when the company was incorporated in 1971. Frederick W. Smith started with a revolutionary idea to create an airline to solve the logistics challenges businesses faced. Operations began in 1973 with the pickup and delivery of the first overnight packages. There were only 186 packages that night, but Federal Express created a new industry offering express door-to-door services. Since then, FedEx has grown to also offer ground and LTL freight services, plus many other business solutions for our customers. 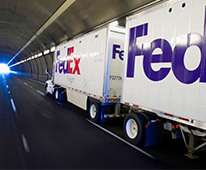 The mission of FedEx Corporation is to produce superior financial returns for shareowners by providing high value-added logistics, transportation, and related information services through focused operating companies that compete collectively and operate independently. Explore our history further in the interactive timeline below. The beginning of a new industry offering express door-to-door services. Extension of our express service offerings to a growing number of international locations. The addition of ground and LTL freight services plus a growing portfolio of transportation, e-commerce, and business services.